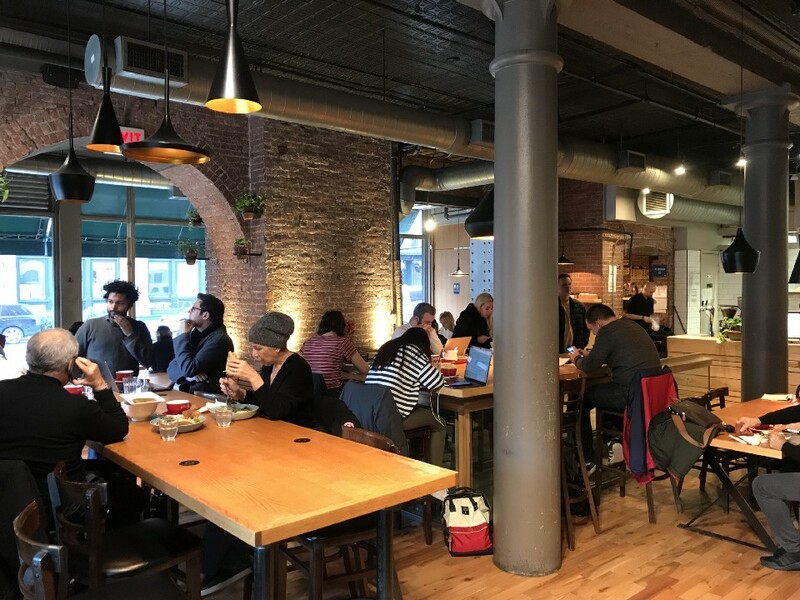 It’s not difficult to find a coffeeshop you can lug a laptop to in New York City, but it can be a struggle during harsh weather. If your destination is half a mile away from the train station on a snowy day, the bitter cold might freeze your work flow before you get there. And don’t forget about the mad dash from one air-conditioned spot to the next in the summer heat. 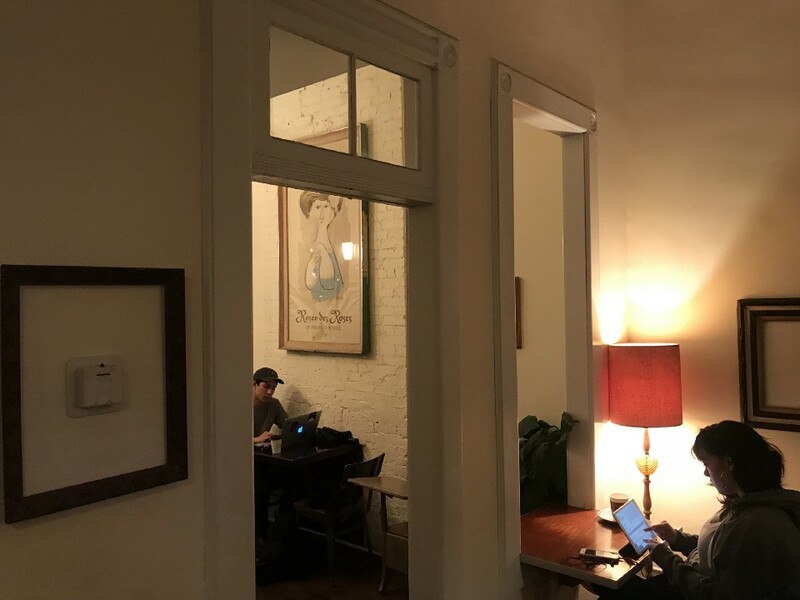 Here are a few suggestions for a solid office- away-from-the-office that are all a block or less from a subway exit, so you can get your nose into your computer and/or a latte before it gets frostbitten, soaked, or melted. Little Bean is a cozy, bright shop near the top of Central Park. 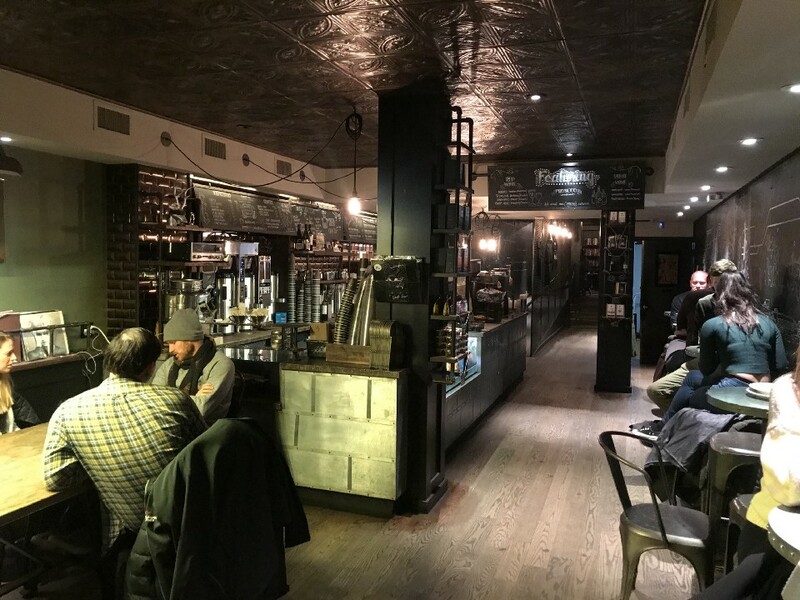 Four tables, plenty of bar space, high ceilings, and a wall of windows make the place feel roomy. 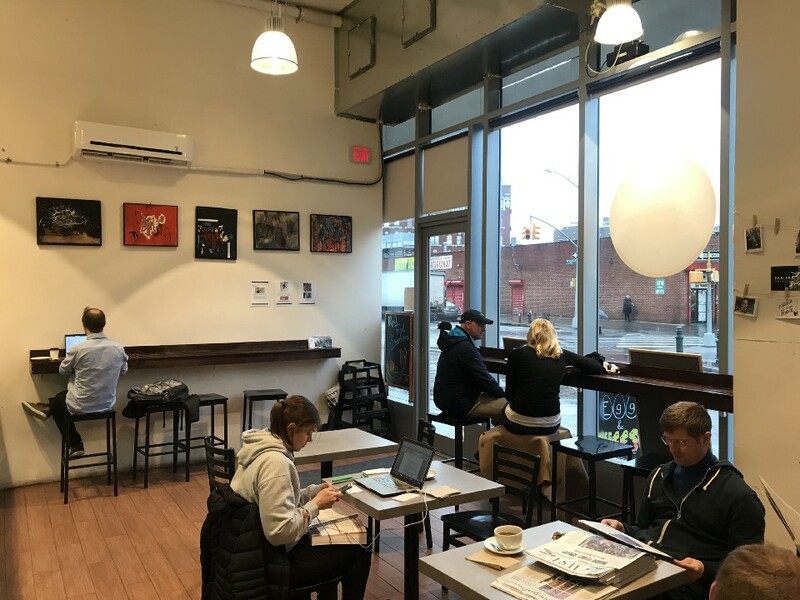 Local artists and merchants have decked out the walls for a neighborhood touch on what’s otherwise a clean, pop-in-and-out kind of cafe. The music is never too loud, the murmur never distracting. Beware the long-term campout as there’s no public bathroom, but you can use the one next door. 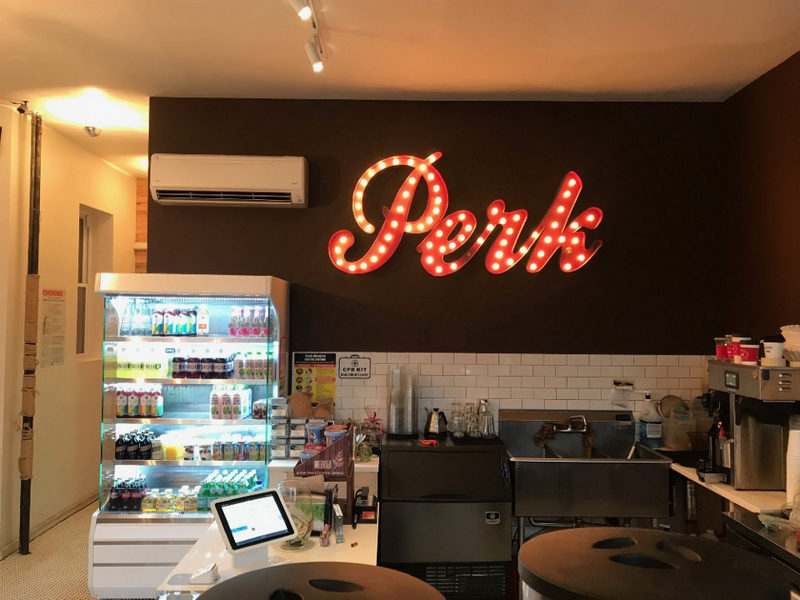 Perk sits across the street from an open lot, which provides plenty of opportunity to take a break from your screen and look at a wide swath of sky. They offer a mix of beverages that aren’t coffee — kombuchas, seltzers, teas, and more. 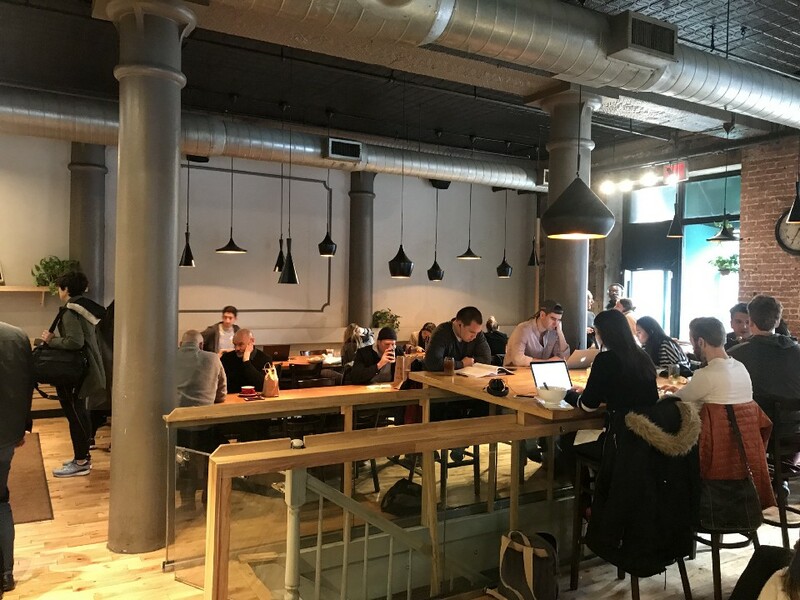 You can set up your computer at the big communal table, one of two smaller tables, or on the reclaimed bar that sits in the windows in the front. Try one of their custom lattes for a pick-me-up (the brown sugar and cinnamon latte is too good to miss). 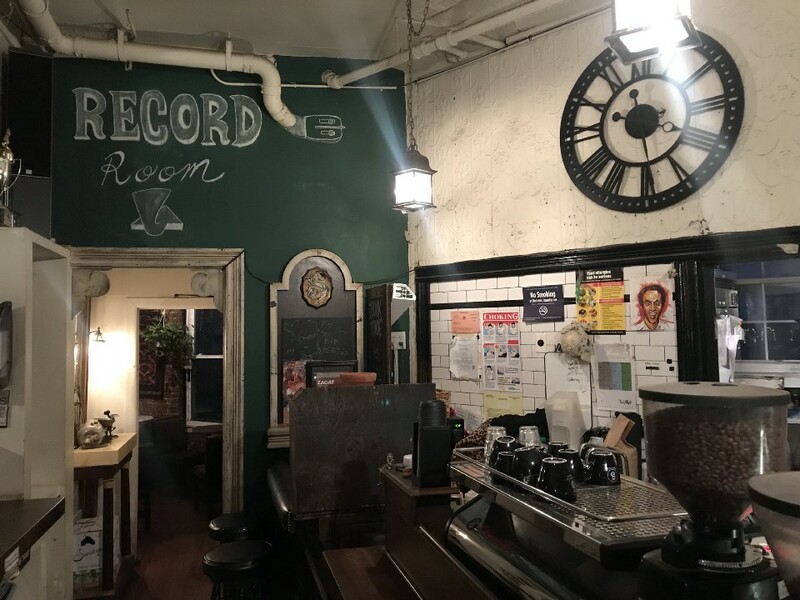 Odd Fox has plenty of little idiosyncrasies — a couple of school desk-and-chair combinations, a stereo playing pop, and even a lego recreation of the shop at the register. There are enough architectural quirks to keep you looking around, plus a backyard for warmer months. And, of course, a solid cup of coffee, not to mention pastries, cookies, and other snacks in abundance. 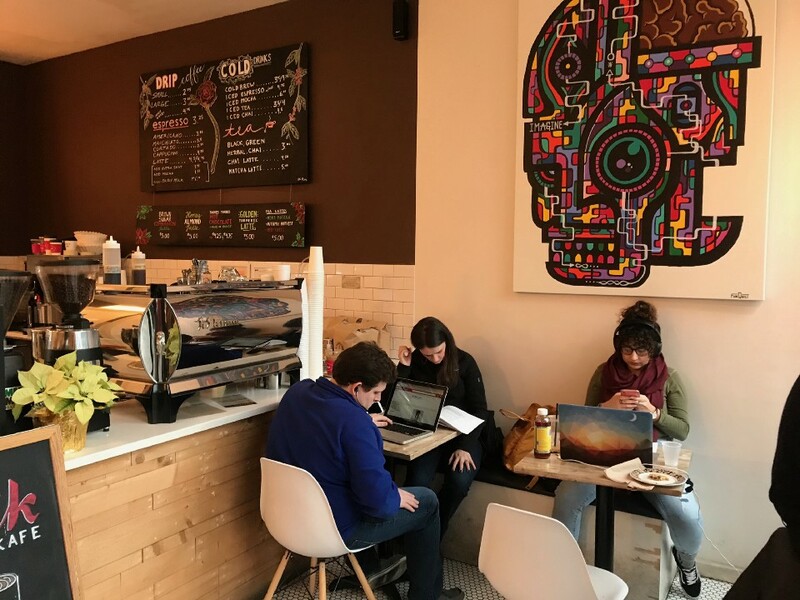 While this cafe may have some of the best seating options on this list, they thoughtfully insist that everyone share tables. If that doesn’t fly there’s plenty of bar space and seats at the front window as well. With a mix of lighting fixtures and funny pictures in eclectic frames, it feels like it could be the house of the the coolest grandmother in the world. Gotan is happy to host you and your laptop, along with many others. Outlets are abundant and often set up with USB ports. The restaurant has large tables, both high and low, with enough room for computers and sandwiches galore. If you need something more private there’s a bit of a nook around the brick columns. Gotan features a full menu that accommodates most dietary restrictions. Be prepared for a cashless transaction and ask at the counter for the WiFi password. 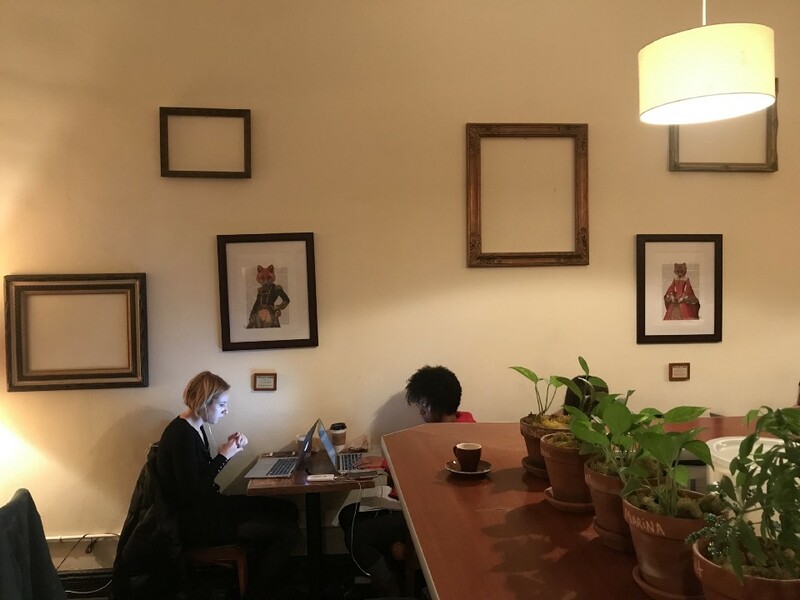 This central coffeeshop in Fort Greene is hardly a secret anymore — it’s an institution. On a weekend you might have to wait for a spot, but everything else here is the gold standard. There are plenty of tables, big comfy chairs, counter space, and even a couple of spots in the window. The menu has sandwiches and bowls if the pastries aren’t enough, and even offers breakfast if you can get there before noon. They do limit WiFi use to one hour, though, which you can renew by purchasing another cup of coffee. 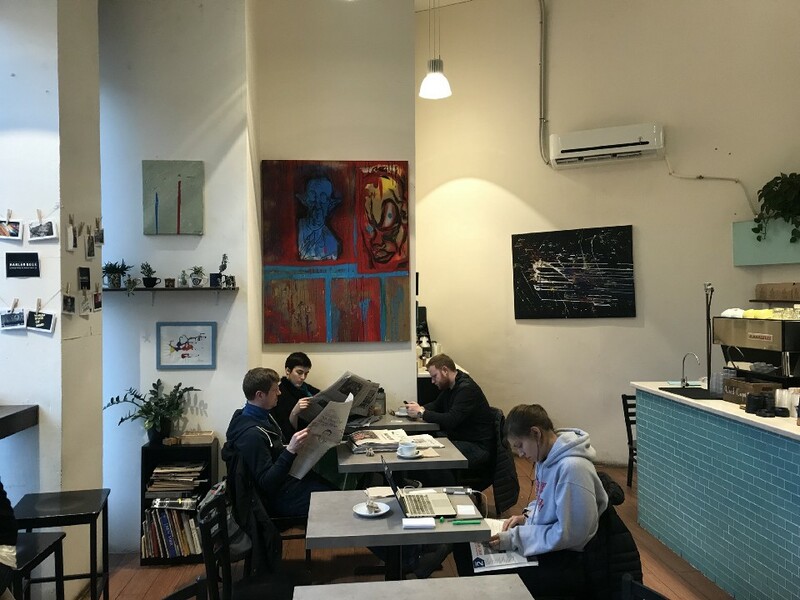 Modern, sleek, and simple in design, AP cafe is also known as “A Place Creative” and aims to provide a space for creative exchange and interaction. There are cups of coffee everywhere and pop-up offices at each table. Jump into larger conversations at the communal tables or have a personal work session. 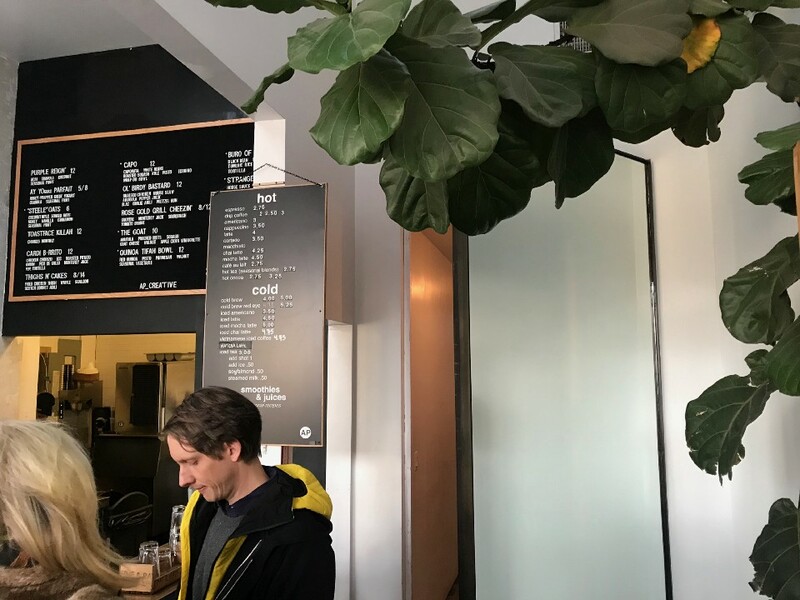 Go beyond coffee and explore the menu — it’s as much coffeeshop as a restaurant with a varied menu and reliable, thoughtful counter service. Need a study break? Go on a brisk walk and look at the street art. 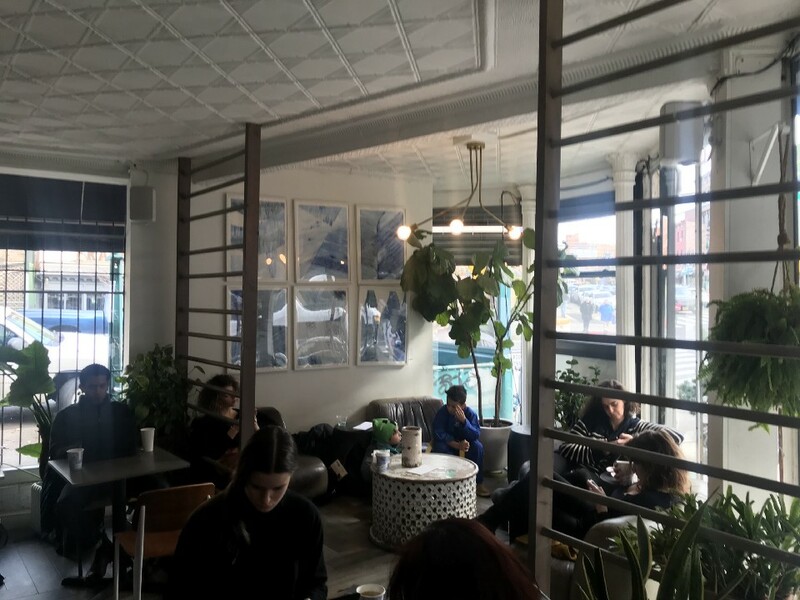 The LIC branch of Sweetleaf feels a little cozier than its other locations. Computer usage is restricted to the laptop room on the right (though you might be able to move around when it’s quiet), which provides a perfect perch for people-watching. Otherwise, tuck into your laptop and the time will fly. 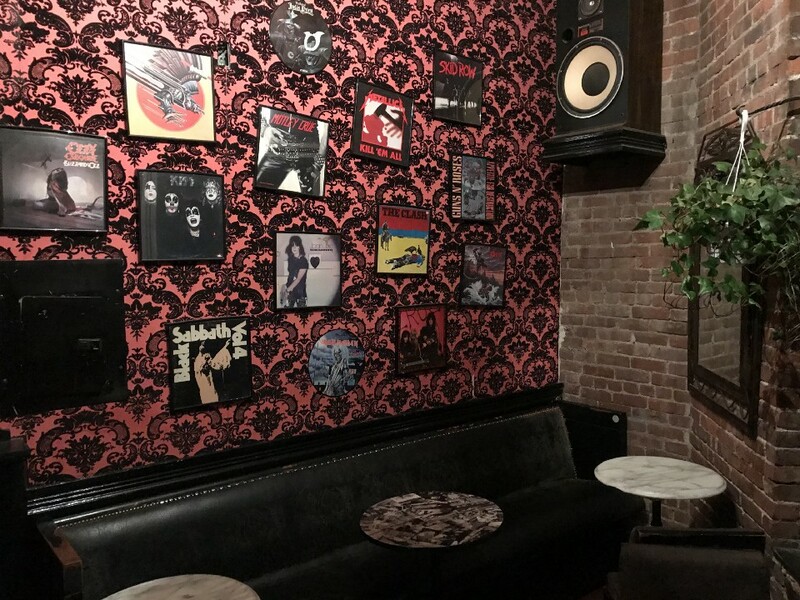 The decor here changes by the foot, all the way back to the best hideaway — the “record room” — in the back. 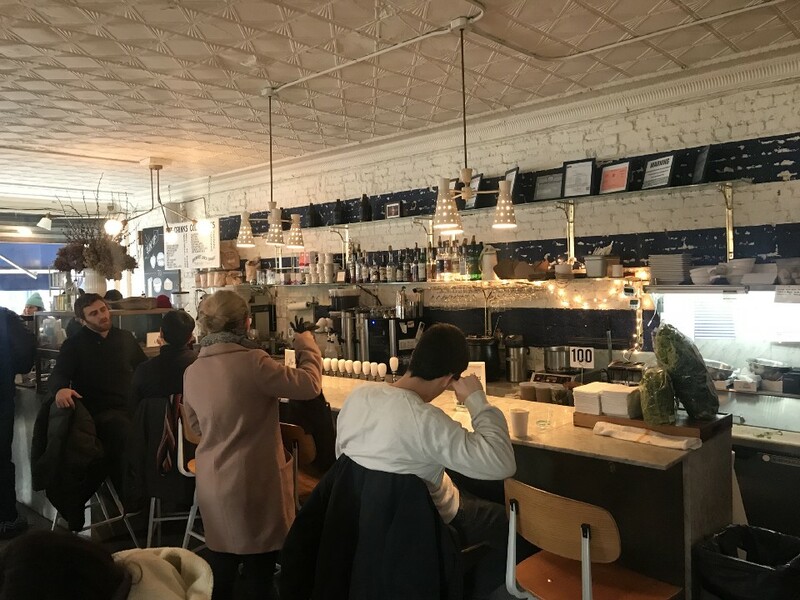 It’s ideal for enjoying one of the house-made baked goods or the broad selection of classic and signature coffees and teas. 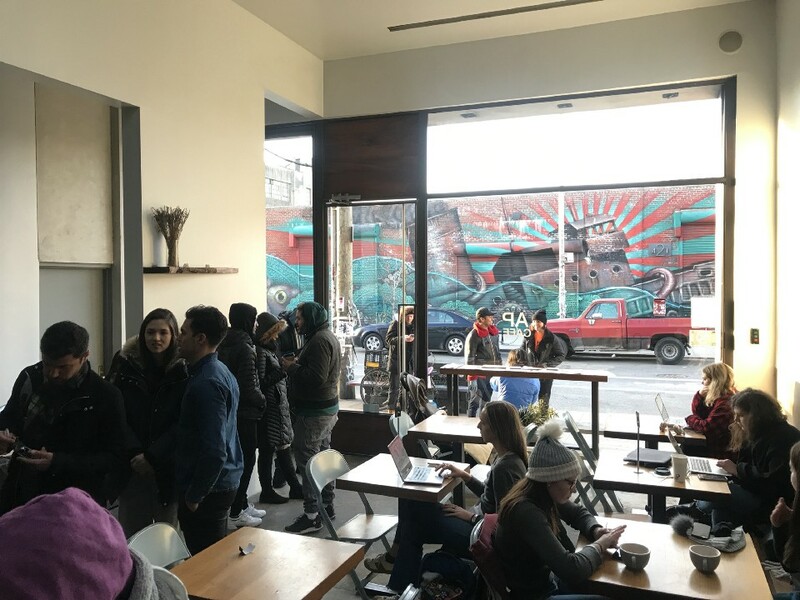 It’s hard to believe that an independent coffeeshop can still hold down a Midtown storefront. They have a full menu of beverages, they’re long on pastry, and offer plenty of fare for a stronger appetite. 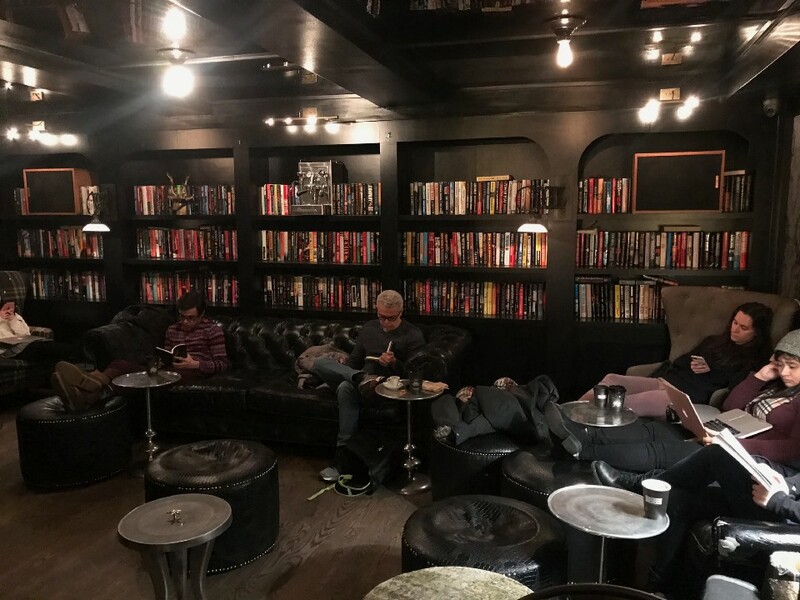 In addition to abundant space at the front of the shop, the book-lined shelves and big chairs in the dark, lamplit back section make for an awesome getaway from the towers of glass and concrete outside. This is a great spot for a quick meeting or to finish up that last bit of work before heading home. Do you have a favorite place to work that’s easy to get to? Share it with us on Facebook, Instagram, or Twitter! All pictures courtesy Jay Sterkel’s outdated iPhone camera.